Fifteen years after the earthquake a man named Antonio de Leon, of the San Sebastian Parish, found the image of the Lord on what was then a forgotten site, and began to venerate it. Antonio was suffering from a malignant tumor in his head, and after he prayed in front of the Image and asked the Lord to heal him. A miracle occurred when he was miraculously healed. God has done many miracles through this image. Several times earthquakes have destroyed the building where the miraculous image stands, and always the wall on where the image is painted has been spared and undamaged! Countless healings, physical as well as spiritual have occurred. From its humble origins the devotion and veneration to the image of the Lord of Miracles has grown to national and international proportions. The procession of the image every year during the month of October, brings close to two million faithful to accompany this beloved Lord of the Miracles in His pilgrimage through the city of Lima bringing hope and consolation for the millions of Catholics who come every year to witness their love and devotion. 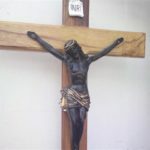 Peruvians who have immigrated to the United States and other parts of the world, have brought with them this beautiful devotion to our Crucified Lord and have formed brotherhoods to keep the devotion alive for them, their children and grandchildren. In all the cities where the brotherhoods have been formed, Masses and processions in honor of the Lord of the Miracles take place every year on, or close to October 18. The original painting was only of the Crucified Christ, the figures of the Virgin and St. mary Magdalene were painted in 1671. There are several versions in regard to the dark color of the image. One is that the smoke of the countless candles that are continuously lighted in the Shrine, made the wood to darken. A cherished tradition is that the image got dark in one night, a miracle that Our Lord did to please and fulfill the wish of the people of Esquipulas. There are countless miracles attributed to the Lord of Esquipulas. The devotion to the Lord of Espuipulas transcends the borders of Guatemala. Millions of pilgrims coming from all of Latin America, as well as from Europe, make the annual prilgrimage to venerate the sacred image. There are several books written about the Lord of Esquipulas and His miracles. There are numerous novena prayers. The Holy Father, Pope John Paul II, visited Guatemala on February 6, 1996, to celebrate the 400th anniversary of the image, and on that occesion, he designated the Shrine as a Basilica. The devotees of the Lord of Esquipulas carry this devotion wherever they go. In Baltimore, and thanks to the initiative of Father John Lavin, C.Ss.R., Mrs. Delfina Pereda, and of the Guatemalan and Latin American communities, a replica of the image was enthroned at St. Patrick’s Church, located on the corners of Broadway and Bank Streets, in the Fells Point area. On January 15, 2000, in spite of a heavy snowfall and intense cold, Father Lavin came from Annapolis to celebrate a Mass in honor of the Lord of Esquipulas. After the Mass, a reception with typical foods from Guatemala and Latin America, was held in the church hall.